“As a second-year linguistics student attempting to unravel the mystery of graduate careers, I was keen to understand how my degree would translate to the e-communication and marketing sector. I embarked on a mission in my second semester to find a work experience placement into which I could dip my toes. I emailed several copywriting and social media firms in York. I was promptly met with a warm and encouraging response from Helen. The following week, we discussed my aims and aspirations over coffee. Doing this helped ensure that a work experience placement would be relevant to my professional goals. “My time at Ink Gardener Copywriting and Social Media was split over two months. As a busy university student, it was incredibly valuable to me to have some flexibility in the time I spent on this placement. Alongside working with Helen in person, I was given a couple of independent projects to complete at home – including this blog! Producing a draft of an online blog for a business – now live at Paper Pot Transplanting – is this the future? This placement challenged me to look at language through a marketing lens. It gave me a greater awareness of how to integrate service/ product promotion into entertaining and engaging content. As my degree is greatly centred around research and analysis, I found it to be refreshing and stimulating to engage with the creativity needed in this industry. Whenever I felt uncertain when undertaking a task, Helen readily offered me assistance and answered any questions I had. Although I had been given independence and responsibility, I felt that I had support wherever it was needed. One of the many valuable lessons I received during my time at Ink Gardener Copywriting and Social Media was about the importance of accessibility in search engine optimization. This covers elements such as including alt text with images so individuals who utilise screen-readers know what the photo shows. I took on Anya because I remember my own frustrations as an undergraduate trying to secure work experience. I had also asked contacts to help my student illustrator friend with her placement, so felt I should show willing. The York St John’s approach is very flexible with a minimum of 7 days up to 15 days to be completed as and when. We arranged for Anya to join me for around two days a week, arriving an hour after I had started. This allowed me to deal with urgent client issues and identify suitable tasks. Vocalising and explaining processes helped cement them in my mind. Also it’s refreshing to work with someone at the beginning of her career with such a different perspective. I loved having a research assistant to help prepare the ground and be a fresh pair of eyes. Any future employers of Anya have a gem on their hands. Hosting a work placement does take up some time so depends on my workload. I would however be happy to try to host one student a year through the York St John’s scheme. 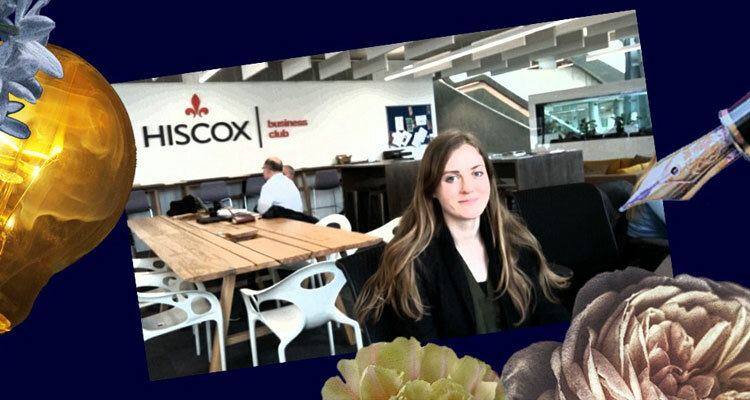 Many thanks to Hiscox Insurance for allowing Anya to become a temporary Business Club member. Also thanks to all my fellow members for making her feel so welcome. In particular the careers advice given by linguistics graduate Jackie Black of Digital Business Communication and Catherine Turnbull Editorial Services was much appreciated.